Much like many business owners I dream. Also like many business owners I dream wildly. You know the dream, there is some market of millions and if you can serve some tiny fraction of that market you’ll be swimming in cash. Of course in this dream it’s so easy to reach that market. I mean how hard could it be to convince 1% of people that you’re smart or that your product is good? You can listen to this review here. Subscribe to Should I Read It so you don’t miss a book that matters. The thing is, we then hit reality. Reality is a harsh master. Reality is that maybe 1% of that 1% know about us and an even smaller fraction of that number cares enough to purchase from us. In his excellent book The Dip, Seth Godin tells us that for many people the biggest problem is obscurity. Not enough people know about you. Sure the market is millions, but if a fraction of a fraction is all that know you exist, you’re not going to get anything moving. This is where Traction, by Gabriel Weinberg and Justin Mares is here help you. Traction is all about giving you a framework to use so that you can…get traction with your business. With traction, you might be able to get at that 1% market you dreamed of reaching. Traction is all about bringing users in to the top of your funnel effectively. Then turning them into clients. It’s about identifying your one metric that matters, to steal the term from The 10x Marketing Formula, and then learning which types of marketing are going to contribute best to that metric. I know that many of my readers are freelancer or very small businesses, so let’s put a caveat here first. Traction is geared towards startups. Places that probably have taken funding and can afford some of the methods they’re going to suggest you try. I have a hard time thinking that billboards will be an effective method for a small web business. It’s going to get some notice sure, but you’re not looking for brand awareness. You’re looking for paying clients and there is going to be a much more effective method than a billboard. Second, don’t fall in to the trap that because a traction channel worked for a similar business it will work for you. Just because my last company got traction in this way didn’t mean it was right for every company. Each company gets it’s traction at a specific time in a market. If you’re early to YouTube then you may not have had to do some things that you see people doing now to get traction. Don’t just copy, test. What worked for you at one point in your business may not continue to work. In fact, as you reach each new level of income/fame/market recognition it’s unlikely that what you used to do will work the way it used to. Don’t get stuck in the way that always worked. Keep looking at your one metric that matters and evaluating how what you’re currently doing contributes to that. Don’t stop doing what’s working because it’s “old”. My friend Jason and I were talking about how he built some of his coaching work on personal talks with people. Then he stopped and … he stopped bringing people in at the same rate. Going back to conversations starting bringing in clients that week. Stick with the single metric that matters. Only look at changing your marketing efforts if you aren’t seeing the same type of traction with current efforts. Finally, if you’re building anything, you need to spend time building traction for your idea. You need to spend as much time building momentum behind your idea as you do building the actual idea. In Perennial Seller, Ryan Holiday talks about how we have a creative fantasy. This fantasy is what has us spending all our time on doing the work and little, if any time, on building out the marketing for our idea. If you want to build something that wins then this can’t be you. To get you going on building Traction in your business, Weinberg and Mares, give a system to test out what will work for your business. They use the bullseye analogy. Start by testing every single traction method they mention, in addition to any other traction method you can think of. Find the 2 – 3 that move the needle effectively on your single metric and then double down on testing those channels. Identify the single channel that has the most impact. Then, take the other two and only put any effort in to them if they feed well in to the single channel that has the most impact. Don’t keep putting effort in to ads if they were the 3rd place finisher. Dump all your efforts in to the 1st place finisher. One of the reasons you test every single traction channel is that it’s so easy to overlook things that work because others in your field aren’t doing it. What often happens is that all your competitors and your own business end up working on the same traction channel and it’s flooded. This means that far too many startups focus on the same channels and ignore other promising ways to get traction. In fact, often the most underutilized channels in an industry are the most promising ones. The people that can view the channel are overwhelmed and they become blind to so much of what’s going on. Just because your competitors are doing something doesn’t mean it’s working. Nor does it mean that you can deliver on it to the same level as your competitors. In Captivate, Vanessa Van Edwards, reminds us to do the things that we do well. This same idea applies to your Traction channels. If you can’t write, don’t write. If you can’t produce great videos, don’t do videos. Find where you can deliver 10x better than your competition and play in that field. Traction is broken up in to two main parts. Chapters 1 – 5 cover how the bullseye framework should run. It gives you ways to eliminate things that aren’t working and does an okay job at helping you decide on the single metric that matters. If you need to identify that metric then look at The 10x Marketing Formula because it tackled the single metric that matters better. Chapters 6 – 24 give you a brief overview of the different traction channels at your disposal. They cover a bunch of traction channels, and the content is fairly well differentiated. I think that there is a bit of overlap between some parts. Specifically they talk about social ads and then say that it should probably push to content to build more relationship before a sale. That’s content marketing, which gets it’s whole own chapter. It felt like they should combine the two based on the approach they took with the book. I won’t go into detail for each traction channel, but here is a list of what they cover. They do a decent job throughout the book to making sure that you are pointed in the right direction to get started with your efforts in to each field. It’s not an exhaustive look at traction channel, but you can get going without much more research and have something worthwhile. The things I liked about Traction is that it doesn’t just stick to online ways to market your business. It encourages you to look at every way you could market your work and then test them. The issue in this is that for some businesses, a bunch of them just don’t make any sense. Like billboards for your starting content company. You’re not doing brand awareness. I also found that 10x Marketing did a better job of helping you define the single metric that matters. Not that Traction was bad, but 10x was better. Finally, there are other books and resources that will do a better job at helping you understand a specific single traction channel. This is not a book that will teach you to write amazing content that converts. You’ll need to look elsewhere if you want to learn the detailed ins and outs of each channel, but if you read Traction you’ll be pointed in the right direction with your learning. 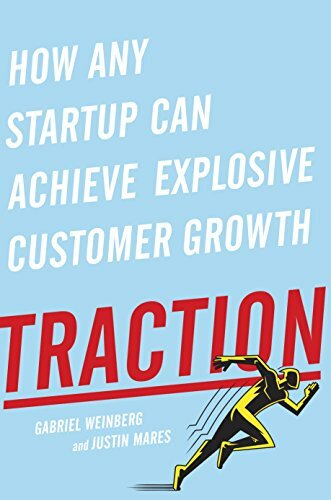 At the end, yes I recommend Traction as a good book to read if you’re trying to get your ideas moving forward. Specifically the ideas in the bullseye framework. Test all the channels, and then focus on the ones that make a difference. Don’t get hung up on the channel that works, just keep an eye on your single metric that matters and do the work that has the greatest affect on that metric. This is an introduction to a number of methods you can use to get traction in your business. It provides a framework to decide which one will work, and then gives you an overview of the many traction channels you should be trying.